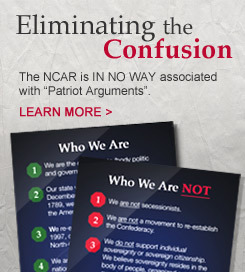 Stay informed with the latest voter information, NCAR meetings and court cases. When & where are NCAR meetings? We the people of North-Carolina have re-established the state that was taken from us on July 1st, 1868 by the United States Military, as the end result of the Reconstruction Acts (1, 2, 3, 4). These Acts imposed on us a military dictatorship, an election, a method of changing our constitution, and a constitution, all foreign to our organic law. Our Constitution, therefore, has been dormant, but not dead, since that date. We are breathing new life into it.